Over time its easy to burn off the extra latte calories. 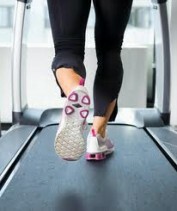 Desk treadmills are designed to run at lower speeds than normal treadmills. This means you won’t get hot and sweaty using them, yet its easy to rack up over 10,000 steps a day! The problem with the modern workplace is that its easy to get up in the morning, hop in the car, drive to work and be sat at your desk for 8 hours before doing the return journey. During this time you will be snacking, drinking full fat coffees, maybe a doughnut. Lunch might be a sandwich, some crisps, maybe a chocolate and a soda. All this adds up and takes its toll. Before you know it you have munched through a few thousand calories, done no exercise and still have dinner to look forward to. By the time you are 40 then the weight has piled on, and you have lost your motivation to workout. 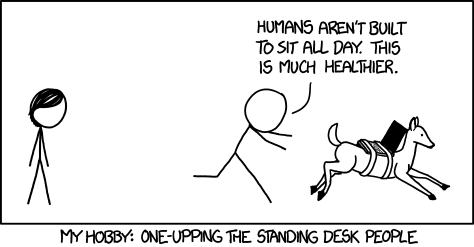 This is why standing desks are becoming increasingly popular. Just a few hours a day on the feet is all it takes to get the blood pumping, and the heart rate up. Even better if you can combine this with a few thousand steps on your treadmill. If you are worried about getting all hot and sweaty don’t be. These treadmills are not running machines, they are barely walking machines. Even a normal walking pace is almost too fast for most users to comfortably use their computers and do work. All you are doing is slowly pacing away, and over time this makes a huge difference to the numbers of calories burned. But will my feet hurt? Possibly, but if you take some simple precautions you will be just fine. Swap out your stiff sensible office shoes for a pair of walking trainers, or even go bare foot! This will keep the noise down, and make life easy on your feet. If you are new to walking, start of with slow short sessions of maybe 15-30 minutes at a time. After a few weeks you will soon be pacing away like a power walker! Just take it easy to begin with and slowly build up to a level where you are comfortable. If you have colleagues around you then at some stage someone is going to start throwing the gauntlet. The idea is not to be pounding away at this 8 hours a day to break some record. Save that for the running track. Remember you are at work, your goal should be a slightly raised heart rate, at a level that still allows you to breath normally to take phone calls, and have a normal pulse so you can think and type effectively. Refined, contemporary design and long-lasting construction make the treadmill desk the perfect addition to your workspace. The whisper-quiet 2.25 HP continuous-duty motor and 6 impact-absorbing compression shocks let you stay respectful of coworkers while you walk for miles each day without impacting office productivity. High-quality components suppress mechanical noise and subdue vibration, keeping your focus on your work. And with mindful, space-saving dimensions, and front-mounted transport wheels for easy mobility, it's simple to include the TR1200-DT5 in your existing office space.